Scrap This, Save That: WOYWW #256...Oh How I Have Missed Thee!! Happy WOYWW!!!!!! I haven't typed those words in SUCH a long time! For those of you who haven't heard, WOYWW stands for What's On Your Workdesk Wednesday. It's hosted by the sweet Julia over at Stamping Ground and she's been doing it EVERY week for almost FIVE years!!! It takes a little courage to do it for the first time, since it involves taking a pic of your crafting desk AS IS with no cleaning up first. It's so we can all take a peek at what you're working on and where you work, and it's super great fun!! I haven't been able to participate in probably more than a year, but here I go again!! On my desk this week is some preparation for my daughter's upcoming bridal shower! I found a few prizes for games that we'll be playing at the event, and wrapped them in gift bags and tissue paper. If there's time, I'll go back and decorate the bags...I'm sure I'll make time! Once I do that, I'll be sure to post the results. 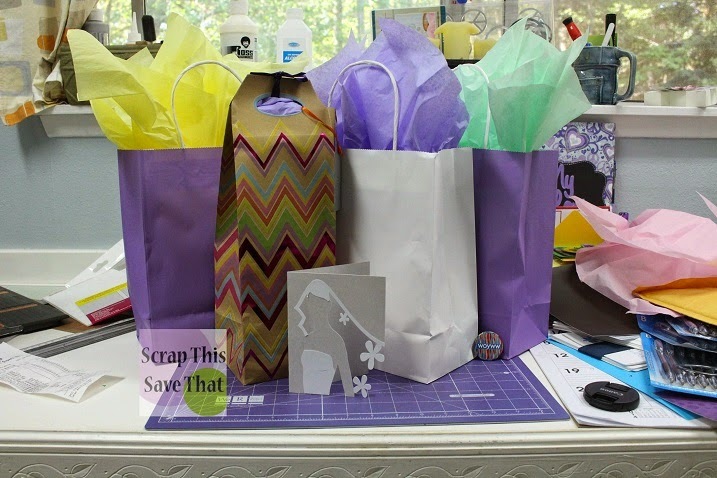 In front of the bags, is the bridal shower invitation I made and sent out. The one shown doesn't include all the insides with info, but that was all printed on vellum with a white mat behind it, and then attached with small silver brads. A really long time ago when I was a regular WOYWW-er, Miss Julia sent me the sweetest WOYWW button/badge. I feel very privileged to have one, and as soon as I got it, I started hiding it in my weekly messy desk photos, for visitors to find and post in the comments if they felt moved to do so! So falling back on tradition, I'm doing it again. This week is super easy just to get you warmed up, but don't always expect it to be quite so simple! So...where's the button in the photo? Can you find it? Thanks for stopping by! I'm going to go hit the linky list and start visiting my old woyww friends and make some new ones! See you soon! Beautiful gift bags and I see it. Love the shower invite! Can't wait to see your decorated bags! I spy a button! Thanks for sharing! Very cool shower invitation. Yes I see the button and a receipt with lots of item tallied. Your desk is not messy...there is room to use the push aside method. I see the button next to my favorite color! Have a great time at the shower. So much planning! Enjoy our sunshine it's so nice to be warm! Oh my, Amy! The bridal invitation is so gorgeous!!!! Love the fun colors of the bags and tissue and ahaha, I spy the button!!! Aren't you just super fun!!! Can't wait to see your desk next week!